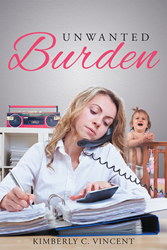 Recent release “Unwanted Burden” from Page Publishing author Kimberly C. Vincent is both riveting and passionate; this work tells the author’s story about her life of abandonment and mistreatment. Kimberly C. Vincent, a devoted writer and author, has completed her first autobiography “Unwanted Burden”: a gripping and potent work that delves into the ideas of fear, strength, trust and acceptance. Published by New York City-based Page Publishing, Kimberly C. Vincent’s poignant tale will pull at the reader’s heart strings and leave the reader with a sense of understanding. Vincent explains, “This is the story of my being born to a mother who didn't want me, didn't have time for me, and developing a crippling shyness from her neglect. My father tried to make up for her neglect by showing me extra attention, which caused my siblings to resent me and possibly hate me. I wasn't allowed the education or career I wanted because I was treated as if I was retarded. I wasn't even allowed to choose my own husband and suffered severely because of it. I suffered a life of neglect and abuse and have even looked down four gun barrels and lived to tell about it. In addition, this story tells how abuse affects your interaction with people and undermines your ability to trust even some in your own family. I hope this story will help others who have gone through similar situations." On top of all of this, Kimberly Vincent didn't know that some of the people who married into her family were only concerned about themselves and would destroy the lives of others to get what they wanted and that especially included her. She has had a target on her back since she was a three-year-old child. Readers who wish to experience this profound work can purchase “Unwanted Burden” at bookstores everywhere, or online at the Apple iTunes store, Amazon, Google Play or Barnes and Noble.